In Italy, Easter is a very important and greatly celebrated religious holiday. In fact to many of Italian heritage, Easter is far more significant than Christmas, as it marks the resurrection of Christ and the miracle of resurrection at the core of the Christian faith. 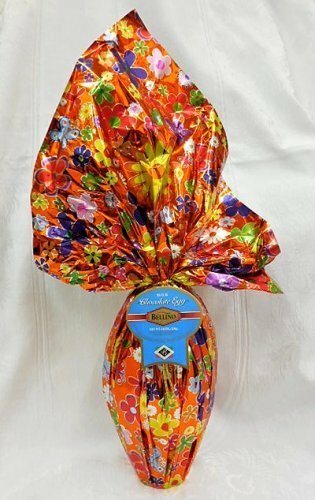 I always got excited at the sight of the colorful foil wrapping, the enormous size of the hollow chocolate egg, and I would wonder eagerly about what small prize or toy would be inside. When I see these eggs for sale in Italian markets around Easter time, it always brings back fond memories of those times. 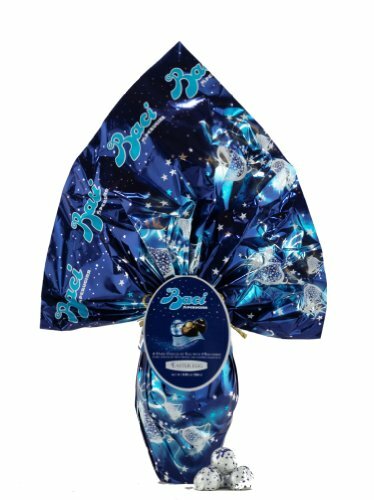 While available, why not get a giant Italian chocolate Easter egg for your children or another loved one this Easter season? It's sure to surprise and delight any recipient, and it's a chance to introduce a unique holiday tradition from a different country in to your own Easter celebrations. 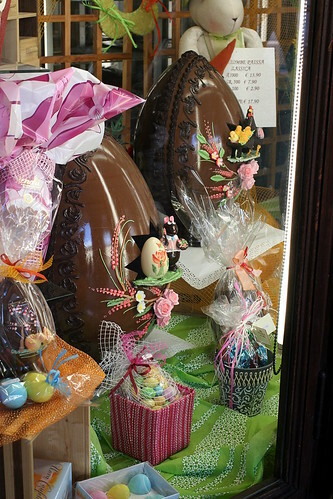 Beautiful handmade and decorated chocolate Easter eggs on display in Torino, Italy. Bellino - Italian Milk Chocolate Egg, (2)- 3.5 oz. Pkgs. These handmade eggs are often then decorated with more chocolate, icing and candy before being wrapped in colorful foil and ribbons. 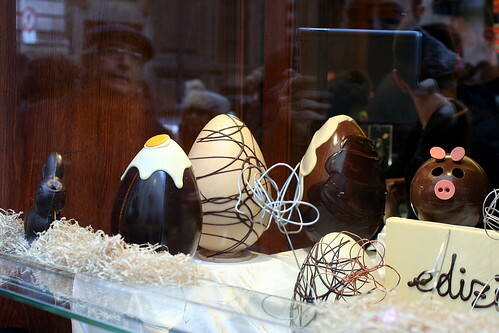 Of course, finding a chocolate maker to create one of these beautiful eggs outside of Italy could be difficult - and expensive! So also popular, in Italy as well as abroad, are giant chocolate Easter Eggs made commercially by chocolate companies such as Perugina. While they may lack that "handmade touch", the quality of the chocolate is always high (far better than most mass produced chocolate in, say, the United States) and the delight at receiving one of these large eggs unquestionable. Bellino is one Italian chocolatier who produces and sells large chocolate Easter eggs you can purchase online. These are a great way to share an Italian tradition with your family. 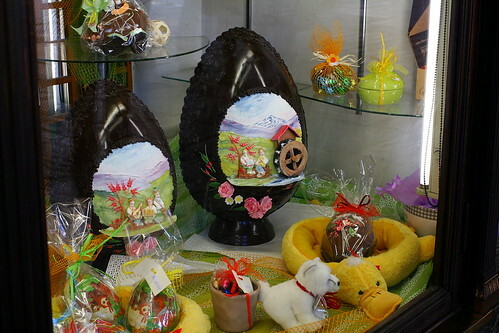 Artistic chocolate Easter eggs in a bakery display in Italy. 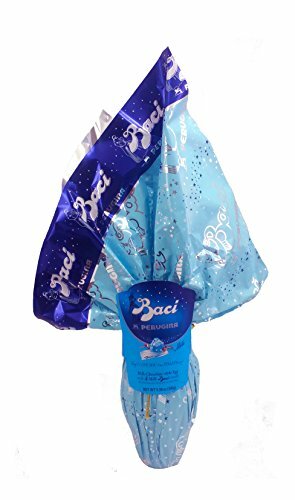 As a child I always loved Perugina chocolates - especially their hazelnut-filled "Baci" kisses. These giant chocolate Easter eggs come in either dark or milk chocolate varieties, and the gifts inside? Four mini-eggs or more "Baci" chocolates. These are great for the chocolate-lover in your family for sure! Watch a handmade Italian chocolate Easter Egg being made! In the video below, you can see how an Italian bakery prepares a traditional chocolate Easter Egg and decorates it by hand. 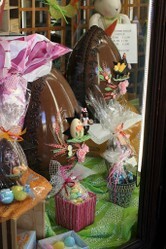 Then enjoy a second video which showcases some of the beautiful Easter Eggs made and sold in bakeries in Italy today. 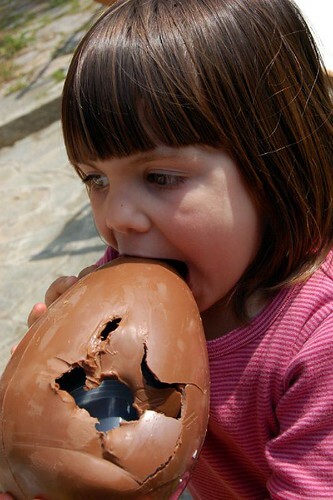 Children love these giant chocolate eggs! Are you ready for Easter this year? You say that to many Italians Easter is more important than Christmas, but it is not just Italians who hold this belief, for it is a very and truly Christian belief. But when I see your pictures I am reminded of just how wonderful a place Italy is and what a great artistic and culinary culture it has. I am coming to Northern Italy, the Dolomites, in early September. Thank you for the comment! The hand-made and decorated Easter Eggs in Italy are really something, one of those truly special traditions—and so creative, too! Excellent. This has put a smile on my face in what has been a dreadfully cold a miserable patch in the UK. Easter Eggs like these are a massive thing in the UK but even UK eggs don't compare to these beauties. Your delight really shines through your words as a writer. Thank you for posting. I love Easter and I now feel it is on its way after reading this.